Background: Multiple Myeloma (MM) cells inhibit the development of an effective anti- MM immune response via defects in T cell function, ineffective antigen presentation; reduced phagocytic capacity; natural killer and dendritic cell dysfunction; decreased responsiveness to IL-2 and defects in B cell immunity; upregulation of inhibitory pathways; and production of excessive proinflammatory cytokines. Moreover, immune cells including plasmacytoid dendritic cells and macrophages trigger tumor cell proliferation, survival, and drug resistance. The usefulness of immunotherapies in MM patients has first been supported by the identification of the graft-versus-myeloma effect in the context of allogeneic bone marrow (BM) transplantation. Subsequently, the inclusion of thalidomide and its derivatives, the Immunomodulatory Drugs (IMiDs) as well as of (immuno) proteasome inhibitors into MM regimens dramatically improved MM patients outcome during the last 15 years. Despite these unprecedented therapeutic advances MM remains an incurable disease. 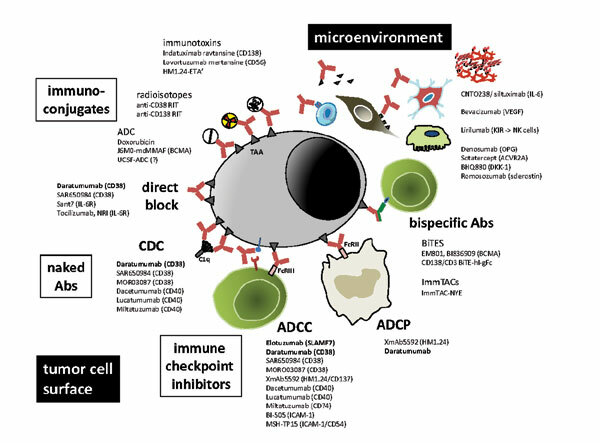 Objective: This article reviews novel immunotherapeutic approaches, which aim to restore the balance within the immunologic niche of the MM BM microenvironment. Method: A systematic search was conducted of the Pubmed Medline, Embase, and Cochrane Library databases for primary articles, as well as of conference abstracts (e.g., of the American Society of Hematology, the American Society of Clinical Oncology, the American Association of Cancer Research, the European Hematology Association, and the Multiple Myeloma Workshop), practice guidelines, and registries of clinical trials. Results: The inclusion of monoclonal antibodies, immune checkpoint inhibitors, chimeric antigen receptor-engineered (CAR) T cells, genetically engineered T cells, and vaccination, dendritic cellbased cancer vaccines in particular, into existing regimens is likely to significantly improve MM patient outcome in the near future. Conclusion: Given continuing efforts to target the immune niche within the bone marrow microenvironment we are confident that the rise of immunotherapies in MM will result in long-lasting responses in many of our patients within the next decade. Keywords: Multiple Myeloma, immune microenvironment, stem cell transplantation, immunomodulatory drugs (IMiDs), antibody- and peptide- based strategies, adoptive therapy, CAR cells, TCR engineered T cells, immune checkpoint blockade, BiTE®s, vaccines. Keywords:Multiple Myeloma, immune microenvironment, stem cell transplantation, immunomodulatory drugs (IMiDs), antibody- and peptide- based strategies, adoptive therapy, CAR cells, TCR engineered T cells, immune checkpoint blockade, BiTE®s, vaccines. Abstract:Background: Multiple Myeloma (MM) cells inhibit the development of an effective anti- MM immune response via defects in T cell function, ineffective antigen presentation; reduced phagocytic capacity; natural killer and dendritic cell dysfunction; decreased responsiveness to IL-2 and defects in B cell immunity; upregulation of inhibitory pathways; and production of excessive proinflammatory cytokines. Moreover, immune cells including plasmacytoid dendritic cells and macrophages trigger tumor cell proliferation, survival, and drug resistance. The usefulness of immunotherapies in MM patients has first been supported by the identification of the graft-versus-myeloma effect in the context of allogeneic bone marrow (BM) transplantation. Subsequently, the inclusion of thalidomide and its derivatives, the Immunomodulatory Drugs (IMiDs) as well as of (immuno) proteasome inhibitors into MM regimens dramatically improved MM patients outcome during the last 15 years. Despite these unprecedented therapeutic advances MM remains an incurable disease.